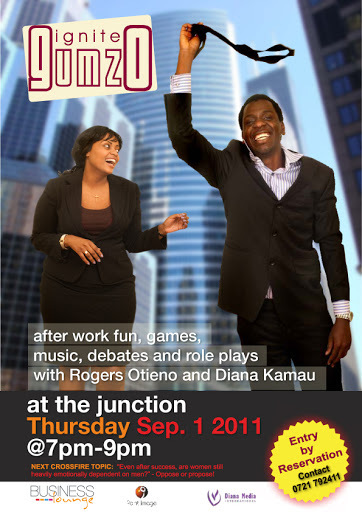 IGNITE GUMZO-Fun club for kenyan workers. Need a break after a day of meetings and proposals? We’ll get you back to the madness later but meanwhile, join us for our regular 1st Thursday of the month evening conversations. FREE and open to all, our talks will revolve around a range of lively topics affecting professionals and organizations alike. You can stage a skit with your colleagues. Sing about an outrageous news story. Engage others in discussing the latest world crisis is how you unwind, why not? Ignite Gumzo is an informal session to escape the merciless clutches of your demanding job and a chance to network with other professionals, our evening presents a chance to explore passions that you ditched after college. It will be light, easy and casual and anyone can participate. Come along and let your guard down and don’t forget to have FUN! !